Paris, Musée d’Orsay, from 7 February to 6 May 2012. 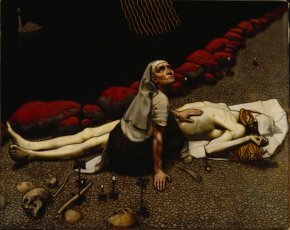 Despite having studied and lived several times in France, made friends there, decorated the Finnish pavilion for the Exposition universelle of 1900 and participated in the Finnish exhibition for the Salon d’Automne in 1908, Gallen-Kallela has never enjoyed a retrospective in our country up to now. The bibliography is just as poor : there has not been a single publication on his work written entirely in French. This is indeed disappointing given the fact that he was, amid a very rich generation of Finnish artists (Enckell, Edelfelt, Simberg, Halonen, the sculptor Vallgren and many others), the most emblematic of them all. Even more, on certain occasions when some of the painter’s works were included in thematic exhibitions, they were not always welcomed accordingly : for example, and we omit the author’s name in an act of kindness, the statement made in 1998 by a "critic" during the exhibition Visions du nord at the Musée d’art moderne de la Ville de Paris, which presented some of Gallen-Kallela’s canvases : "The Finnish Gallen-Kallela, known for finding his inspiration in the ’national’ legends of the Kalevala, here, is just a painter of colour-prints [chromos] opposing the sensuality of ice cream of a frozen nature to big-game souvenirs brought back from Kenya". It goes without saying that the artist deserved much more than the indifference or pedantry shown until today. 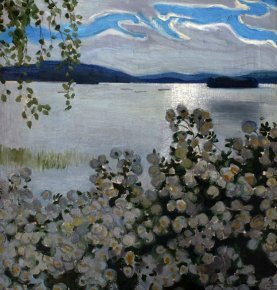 The remarkable exhibition at the Musée d’Orsay, which opened first in Helsinki and will then move on to Düsseldorf in June, finally pays due tribute to Gallen-Kallela’s work. The curators have made a sound decision in restricting the selection to works of the highest quality ; as in the case of any prolific artist, the artistic level can sometimes fluctuate and a monographic exhibition of exhaustive range can dull the image of the painter by reducing the impact of the show’s theme (see the exhibition on Théo van Rysselberghe at the Palais des Beaux-Arts in Brussels, 2006). Here, as in the case of Willumsen or Hodler, the Musée d’Orsay and its partners have selected a series of masterpieces for each period and/or theme : almost 90 items (including decorative arts) illustrate the artistic itinerary and the painter’s unique personality. Born in 1865 in Pori on the western coast of the great-duchy of Finland, then a province of the Russian Empire, Akseli Gallen (he would take on his definitive name in 1907 only) studied in Helsinki ; unresponsive to traditional education methods as well as to the Swedish language, already sensitive to the question of Finnish identity, he quickly turned to art, his real passion, and took drawing classes at the Fine Arts Academy of Finland. 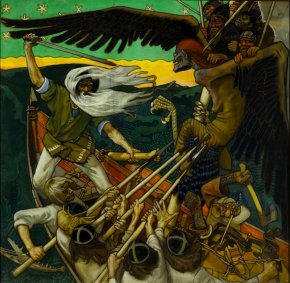 The legends of the Kalevala and Finnish landscapes possesed the artist long before determining his career path. Shortly before turning 20, he left for Paris where he returned three times in a row between 1884 and 1889. The first sections of the exhibition illustrate the painter’s work during his stays as well as the obvious influence of French art on his canvases. Although Gallen-Kallela took classes under Bouguereau and Robert-Fleury at the Academy Julian, he did not apppreciate their work but preferred rather Fernand Cormon, studying in his studio ; he perhaps found a model in the well-known historical and prehistorical scenes of this last master that would help him in his own search for the immemorial roots of Finnish identity. 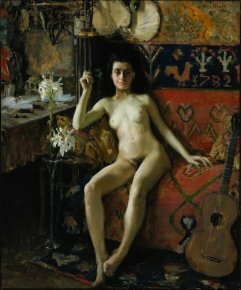 This early period resulted in a series of academic nudes, street Parisian Boulevard (ill. 1) or studio scenes, such as Unmasked (ill. 2) and various portraits. These canvases clearly reflect the aesthetics of French realism ; we can see this influence in the following section which highlights portraits (with a mix from different periods so of varying aesthetics) but especially in the room evoking rural life. 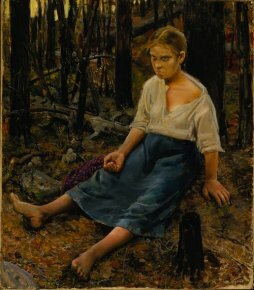 The artist, who in talking about his stay in France confided that he had never painted the countryside (perhaps too civilized for someone from the vast open spaces of Northern Europe), enjoyed describing Finnish peasants, with whom he was familiar having been brought up as a child in the country. 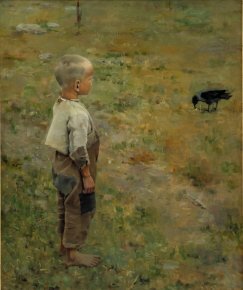 The Boy and the Crow (ill. 3), The Old Woman and the Cat (ill. 4) or Lost (ill. 5) all bear the traces of Bastien-Lepage’s art, common to most of the foreign artists who came to France and saw his paintings. This in no way substracts from the beauty and uniqueness of these canvases which, however, reflect a very different harshness than that of the French countryside with specifically Finnish physical types and landscapes. 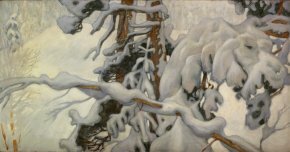 Other works, particularly interior scenes, soon reveal the makings of a more personal, more vigorous and more chromatic style while the feel for nature, which will be the central element of Gallen-Kallela’s work, dominates the composition. 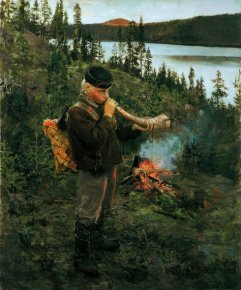 The Shepherd of Paanajärvi (ill. 6) establishes a link between this simple humanity and a pantheistic landscape. The following section evokes Symbolism. 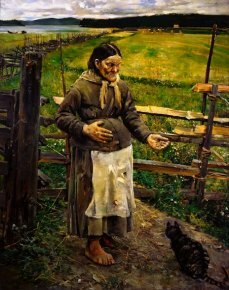 In the 1890’s, Gallen-Kallela was drawn in by the general current of spiritualism and the search for meaning which gripped all of Europe and was embodied in the Idealist movement. Obviously, it is difficult and perhaps debatable to establish a separation between works specifically of a "Symbolist subject" and the large pantheistic landscapes which, quite clearly, also fall under Symbolism. The images illustrating the Kalevala and the decor Gallen-Kallela produced for the Juselius Mausoleum also reflect partly or in their entirety the Symbolist credo. Here we have four successive rooms which offer up a series of masterpieces, alone, worth the visit. 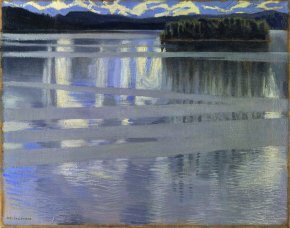 Ad Astra (ill. 7), Symposium (ill. 8) and The Trip to Tuonela (ill. 9), all dating from 1893-1894, attest to the painter’s Idealist impregnation. 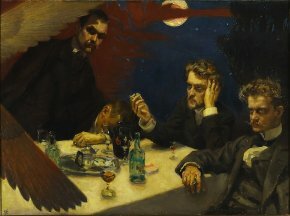 These admirable works illustrate the themes of the mystery of creation and life implementing original plastic formulas : in Symposium, which can be considered a manifesto, the wings of an angel alight upon several figures, including the composer Jean Sibelius, whereas the critic, whose profession is "to see" is sleeping. The idea of the artist as a chosen being and demiurge who, alone, sees the invisible, is obviously very present in these works. A study of this painting, not present in the exhibition but reproduced in the catalogue, shows the silhouette of a figure with its arms raised standing out against the cosmic sphere in the background : the completed work eliminates this presence but the same theme appears, majestically, in Ad Astra, undoubtedly one of the most beautiful European Symbolist paintings. A cosmic vision of the resurrection, of impressive plastic impact, this work, sacralized by an ecclesial frame, remained in the artist’s studio his whole life. Gallen-Kallela read the theosophical philosophers, owned the astronomy books, tainted with mysticism of Camille Flammarion and visited the first Salon de la Rose+Croix in 1892 : there is no doubt that he shared the questioning of most Symbolists on the meaning and evolution of art. His Trip to Tuonela, which Laura Gutman-Hanhivaara, in her essay, associates in a convincing manner to the Rosicrucian poster of Carlos Schwabe, rounds out this impressive corpus. 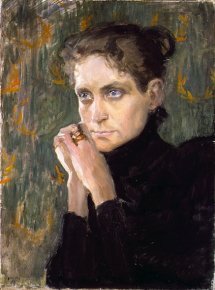 A beautiful head of Christ, The River of the Dead (1894), Orante (1894) but also portraits, presented in a previous section, also reflect this atmosphere : as is the case for Portrait of the Actress Ida Aalberg (ill. 10), also from 1893, which transfers spiritual preoccupations to a more intimate sphere : against a patterned wallpaper or fabric with motifs of laurel crowns, the gleaming eyes of the figure stare out at the invisible with crossed hands. How can we not relate the idealist visions of the landscapes, one of the most extraordinary rooms in the exhibition, to the Symbolist context and the artist’s spiritualist works ? Although the mystical aspect of nature appears very early in Gallen-Kallela, the manner in which it is treated changes with time. Distancing himself rather quickly from Bastien-Lepage, still perceptible in The Shepherd of Paanajävni, the artist opts for a more personal, unifying style and an ever "stronger" colour palette as the years pass. 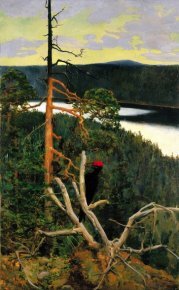 Icons such as The Black Woodpecker (ill. 11) and The Rapids at Mäntykoski (ill. 12), from 1892-1894 illustrate a symbolic motif (the bird, symbol of life in the first, the falls and the five gold strings, musical motif in the second) ; at the end of the century and around 1900, the canvases adopt a more assertive pictoral form, instilling a hypnotic presence on the motif. 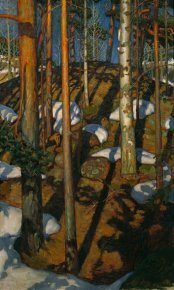 In Spring in Kalela (ill. 13), or The Lair of the Lynx (ill. 14) : here, we recall Munch, there Hodler, in the icy visions, the stark skies or geometric reflections. Lake Keitele (ill. 15) and White Roses (ill. 16), for example, bring together a true vision of nature and plastic experimentation, while maintaining the search for "decorative" effects. Nature is also present in Gallen-Kallela works inspired by the Kalevala, Finland’s national epic poem reconstructed between 1835 and 1849 by the folklore specialist Elias Rönnrot based on oral tradition gleaned in the countryside and particularly in Karelia, a region dear to the artist. These Nordic myths correspond to Gallen-Kallela’s preoccupation with questions of identity in Finland’s political context at a time when it was still under the Russian Empire. Although the artist was to later devote himself essentially to a public role, here it is only about painting. 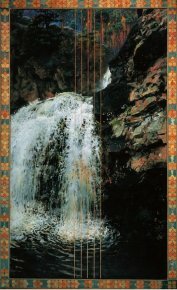 While these canvases made him famous and gained him national acclaim, they also are part of his artistic evolution. The large tryptich The Legend of Aino (ill. 17), exceptionally lent by the Finnish National Gallery, dates from 1891 : in it we see the influence of Bastien-Lepage, despite the innately Finnish subject. Other, slightly later works, adapt the artist’s style to the epic poem, with a strict, "image filled" treatment, suited to the narrative : and yet the artist achieves strong and original representations as with The Defense of Sampo (ill. 18) or the famous and admirable Mother of Lemminkäinen (ill. 19), a veritable Nordic Pietà. 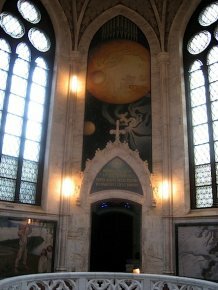 The alliance of myth, idealism and landscape can also be found in the artist’s "Sistine Chapel", his decor for the Jusélius Mausoleum. 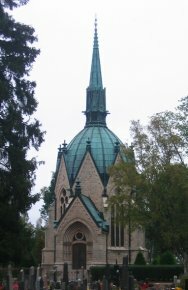 The death, in 1898 of little Sigrid at the age of 11, was so traumatic for her father Arthur Jusélius that he decided to build more than just a funerary chapel, a real mausoleum. 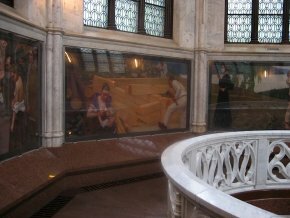 The monument designed by the architect Joseph Stenbäck in a neo-gothic style (ill. 20) includes an open crypt, modeled a bit on Napoleon’s tomb at the Invalides in Paris (ill. 21). A décor in white marble serves to set off the sumptuous panels produced by Gallen-Kallela. 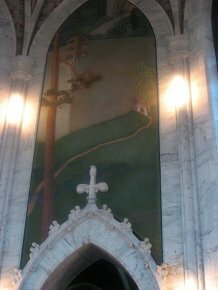 These were painted in fresco and, as they deteriorated then were damaged by fire, later restored in 1930 as closely as possible to the original by the artist’s son. Le Mausolée Jusélius, cimetière de Pori. 21. 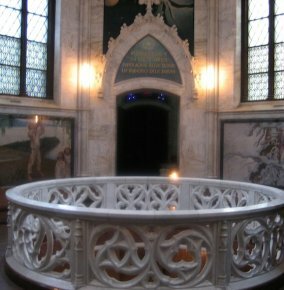 Interior of the Jusélius Mausoleum, Pori. One of the exhibition rooms at the Musée d’Orsay presents the six canvases designed in 1903 as projects for this ensemble ; they represent an Idealist narrative program with a complex and striking iconography, from life to death : Spring (ill. 22), Constructions, On the Banks of the Tuonela River, Destruction, Autumn and finally, Winter (ill. 23) evoke a "panorama" of life with remarkable symbolic and plastic force. 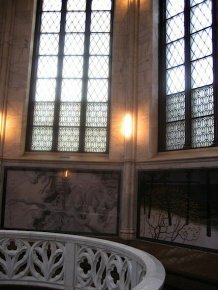 We would venture to express our regret that the exhibition does not present (if they exist) the projects for the panels over the doors of the mausoleum which add the last note of hope to this funeral cycle : in the visions of Paradise (ill. 24) and of the cosmic ether (ill. 25), ideal and transcendental landscapes lead to redemption, ridding the cycle of its strictly somber character. This ensemble, whose effect in situ is stunning (ill. 26 and 27) reveals all of the many artistic resources present in Gallen-Kallela’s art at the height of his inspiration and technical prowess. Two rooms present Gallen-Kallela’s activities in the field of decorative arts. We know that, as did many other artists at the time, he had his house-studio, "Kalela" built in the spirit of total art. Blending traditional techniques with a creativity freely inspired from folkore motifs, Gallen-Kallela created furniture, fabrics, objects surrounding himself with an entirely harmonious universe. We find examples of these ideal houses in various parts of Europe, from Belgium (Fernand Khnopff’s house, now destroyed), to Germany (the Villa Stuck in Munich), Sweden (Carl Larsson’s house) or even Romania (the Cutescu-Storck house-studio) to quote just a few. 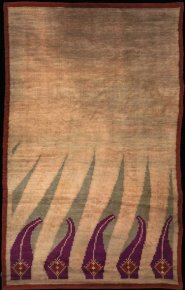 Some very beautiful objects produced by Gallen-Kallela, illustrating these artistic endeavors which combine Finnish primitive inspirations with Art Nouveau influence, are presented here. The artist also worked in this way to create the Iris room for the Finnish pavilion at the Expositon universelle of 1900. Chairs, tables, a cabinet and a rug (ill. 28) form an ensemble recreating the universe of the artist and completing the image of his vision. Gallen-Kallela spent the last decades of his life participating actively in politics, in the troubled era following the end of the Russian Empire and the conflicts resulting in the independence of Finland. 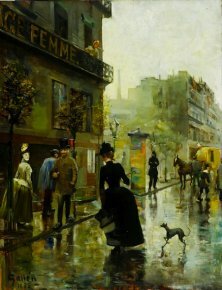 Although the artist continued to paint and executed several large public decors, he also distanced himself from the changes in the art of his time ; while he had been in the forefront of the Symbolist current in the years between 1890 and 1900, the evolution of painting in the 1920’s left him disoriented as it did many of his fellow artists. 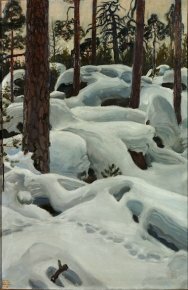 He devoted himself to writing his memoirs and spent more and more time in the middle of the nature he had magnified better than any one else in Finland. However, the exhibition closes with a reminder of his trip to Africa : troubled by the political tensions in his country after the Russians dissolved in 1908 the first freely elected parliament of the previous year, Gallen-Kallela settled temporarily in Paris then decided to visit British west Africa (today Kenya). He spent 16 months there, participated in hunts and safaris, observing local life. The painter brought back an important production of Expressionist works : landscapes, ethnological figures and wild animals make up the repertory of these canvases done in strong colors and a resolutely modern style. We must admit that this rather abrupt conclusion to the show is not its most outstanding section. Not that this aspect of his work is less worthy of our attention but simply because after taking in the previous rooms, this irruption of a purely optical art, in a style made familiar now for over a century, does not add any further understanding to the painter. The catalogue which accompanies the exhibition includes a biography of the artist signed by Janne Gallen-Kallela-Sirén, curator of the exhibiton and a descendant of the artist, current director of the Helsinki Art Museum, as well as several thoroughly enlightening essays. Philippe Thiébaut studies the artist’s residence, "Kalela", as a laboratory for a "modern" national decorative art with extensive sources, documents and evocative sketches ; the question of a national style and the "quest for the primitive" is examined by Fabienne Chevalier and Gallen-Kallela’s relations with Germany are explained by Magdalena M. Moeller. The essay by Laura Gutmann-Hanhivaara, "Un raffiné de civilisation" puts Gallen-Kallela’s art in perspective with the historical, artistic and literary context by way of very convincing juxtapositions and associations. This publication, with excellent reproductions of the works, some images for comparison and, also, fascinating essays, finally provides us with a very useful element in the bibliography. However, and despite trying economic times, we still regret that a more extensive publication was not planned given that, as we mentioned earlier, this artist has never been the subject of a French study. Although this catalogue is a fine publication, entries for the works, supplementary or longer studies, would have been more than welcome. This in no way detracts from the exhibition, magnificently presented in an excellent setting, which deserves a resounding success, on one of the major painters in the history of European art. Curators : Philippe Thiébaut, Janne Gallen-Kallela-Siren, Barbara Til. 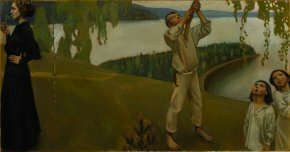 Collective work, Akseli Gallen-Kallela (1865-1931). Une passion finlandaise, Hatje Cantz, 2012, 204 p., 42€. ISBN : 9783775732314. Visitor information : Musée d’Orsay, 62 rue de Lille, 75007 Paris. Tel : +33 (0)1 40 49 48 14. Open every day except Monday, from 9:30 a.m. to 6 p.m., until 9:45 p.m. on Thursdays. Admission : 9€ (reduced : 6.50€).